An ambitious plan to explore a vast lake trapped beneath the Antarctic ice is a step closer to becoming reality. An advance party has braved freezing temperatures to set up vital equipment and supplies at Lake Ellsworth. The project by UK engineers to drill through the two-mile-thick ice-sheet is scheduled for the end of the year. The aims are to search for signs of life in the waters and to extract sediments from the lake floor to better understand the past climate. It is is one of the most challenging British scientific projects for years. The task is so complex that preparations have had to be spread over two Antarctic summer seasons. 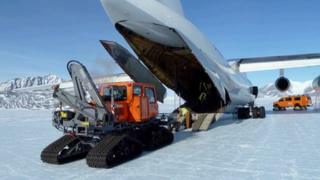 In the first phase a "tractor train" has just hauled nearly 70 tonnes of equipment from an ice runway at Union Glacier through the Ellsworth mountains to the lake site. The journey of about 250km (155 miles) involved crossing a mix of deep snow and rock-hard ice and took three days. Once there, a four-man team stored the equipment and "winterised" it to cope with the incredibly low temperatures to come. Wind-blown snow is expected to partially cover the gear but GPS markers fixed to the corners of the site will help locate it again. The area around Lake Ellsworth is notorious for its deep cold and constant winds. Lake Ellsworth is one of more than 400 sub-glacial lakes in Antarctica and was chosen for the drilling operation because of its relative accessibility. One of the advance team, Andy Tait of the British Antarctic Survey, now back in the UK, told me about the sheer difficultly of conditions. "The maximum summer temperature is minus 20 and with a wind of something like 30 knots you can imagine the cold. "It is really harsh and working there with equipment means you have to use thin gloves - it is really cold." But the delivery of equipment is just one part of the preparations for the drilling and sampling operation. Key components are still being manufactured and tested before they can be shipped south. Most challenging is the complex sampling probe which has been designed to cope with a combination of extremely high pressures and extremely low temperatures. It must also be assembled and delivered in conditions of the highest possible sterility. For the first time in Antarctic exploration, an investigation is being planned with cleanliness standards higher than those of most surgeries. Because one of the key aims is to search for signs of biology in the lake waters - one of the most tantalising questions - all possibility of contamination has to be eliminated. Watch the team's animated explation of the planned drill. I watched as one team worked in a clean room at the National Oceanography Centre in Southampton. Each hi-tech component - including the titanium sampling bottles and specially-engineered filters - has to be sterilised. And the final assembly of the 5.5m probe will take place inside a unique "tent" accessed by gloved inlets along its sides. This November, the second phase of shipments will take place and the operation will begin in earnest. The drilling will be carried out by a system using hot water and is expected to take three days. Once the bore-hole is open providing access to the lake beneath the ice, the team will then have 24 hours in which to lower the sampling devices. Computer modelling indicates that the hole will then start to re-freeze making it impossible to use. The plan is to first lower the water sampling probe - a process that should take an hour - and then a corer to extract lake sediment. According to Andy Tait, all eyes will be on the weather. Although many stages of the operation can be handled under cover, ideally conditions will be calm when the drilling starts. The engineering, the planning, the science are impressively thorough - but Antarctica is the most challenging place on earth in which to work, and outcomes can never be certain.